Sometimes life has a funny way of inspiring me. Last weekend, I had planned to make some smoky shrimp kebabs for a friend's birthday barbeque, so I headed down to Catalina Offshore. I was hoping to score some nice large shrimp (about the 16-20 per pound size) that I could marinate and use for juicy kebabs, but it turned out that they had everything but what I needed. Since I was there anyway (and they sell the most sustainable seafood in San Diego) I decided to pick up some of their bay scallops - I didn't really have a plan for them, but at $6.25 a pound, they were an inexpensive indulgence. 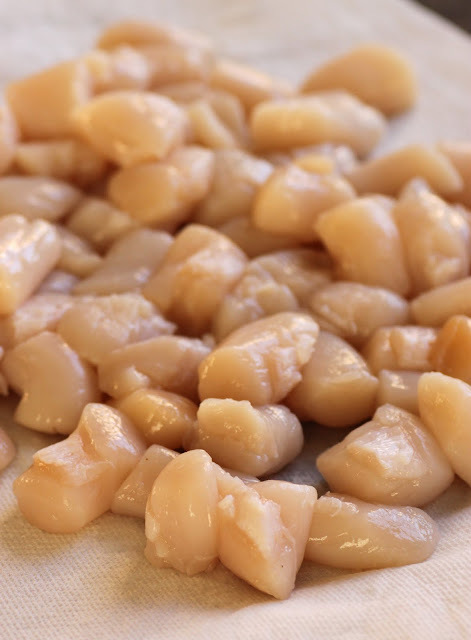 Catalina Offshore bay scallops, sourced from sustainable fisheries in Mexico. Now my problem was, I was excited about getting awesome scallops, but I still needed those shrimp; I had bought some pretty nice tiger prawns from the Asian market before, so I zoomed over there to continue my quest. (At this point I should probably mention that this was all happening early Saturday morning, at which time the Asian market is packed with families, old ladies, and generally no white girls like me. I consider myself pretty fearless, but let me tell you, no matter how small he is, when an ancient Chinese man gives you a stern look that says, "What the hell are you doing in my market," it can make you shake in your boots.) But I was on a mission, so I got in line, found exactly the shrimp I wanted, and headed to the checkout. On my way, I was (predictably) distracted by one magical treat after another, until I found I had wandered over to the produce section. Immediately, these chive buds caught my eye because I had never seen them sold like this before. I impulsively bagged them and added them to my cart, figuring some internet research would clue me in on how to cook them. Bundled Chinese chive buds from the Asian market. 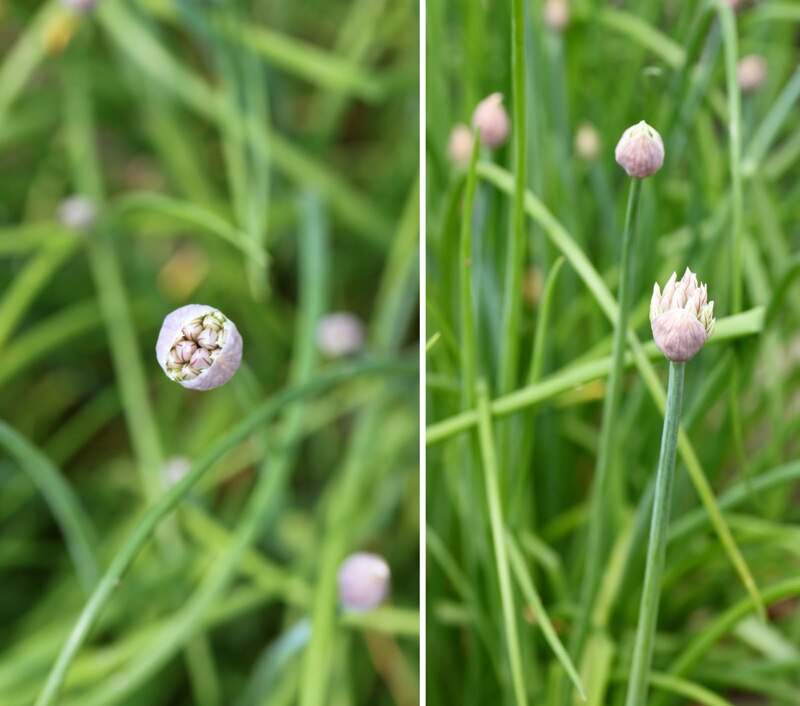 Stems of the chives aren't hollow - making them a bit stiffer - and the flower buds are white. After getting home (and first making my shrimp kebabs), I quickly found online that these Chinese chive buds are most commonly stir-fried. I didn't find a whole lot of other information about these chives, but here is what I can tell you from my experience and discussing with Asian friends. 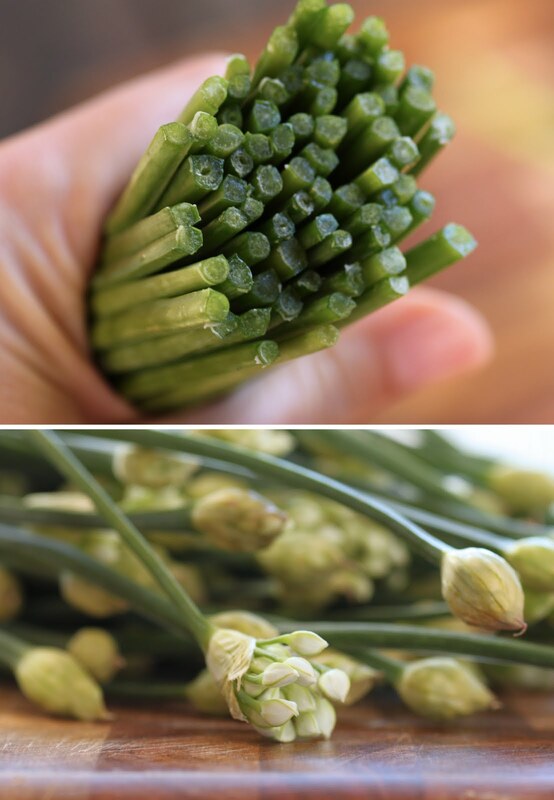 Chinese chive buds are also known as Garlic Chives, and are generally in season in the spring. The younger plants are more delicate and less tough, and they have a mild garlicky and soft taste in comparison to traditional Western chives. Their stem is not completely hollow, and the flower is white - versus the completely hollow stem and common purple flower. 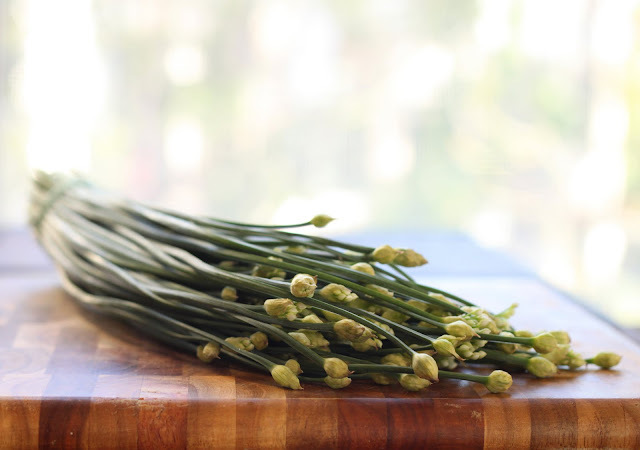 The taste of the bud is also very different; Chinese chive buds have a lovely garlic flavor, while other chive buds have a decidedly bitter taste. Traditional chives have purple buds. These are from my mom's garden. Ok, are you following along so far? Let's recap. I had originally wanted shrimp for kebabs. Somehow (likely because I am easily distracted and indecisive) I also ended up with scallops and Chinese chive buds. What to do with these? I searched the dusty corners of my mind for something that would tie all these ingredients together, and I realized a simple Beurre Blanc Sauce would be perfect. It would be creamy, but not overly rich in flavor, and butter always marries spectacularly with scallops. Plus, the taste of a good Beurre Blanc can make you moan with pleasure. Just mentioning. 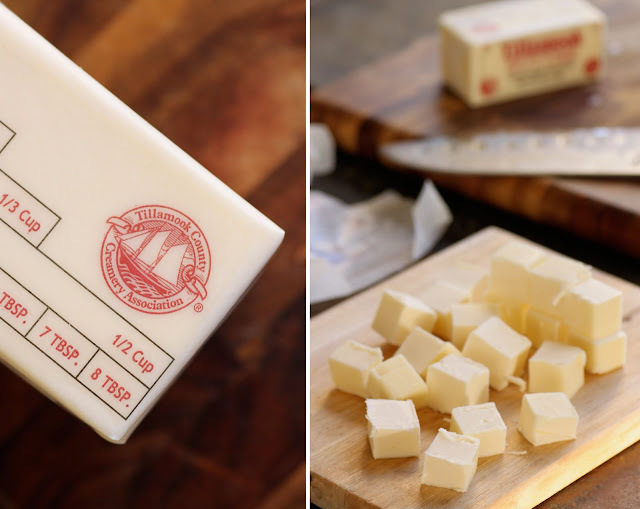 Cubed butter, ready for making Beurre Blanc. Oh Beurre Blanc, how I love thee. And honestly, moan with pleasure is exactly what I did. I seriously think I could drink Beurre Blanc. Or maybe bathe in it. In any case, this imaginative dish exceeded any expectations I had when I originally bought the scallops and the chive buds. I am a generally curious person, but I am so glad I decided to pick up those chive buds, and I would do it again and again - such a discovery. The scallops from Catalina Offshore were also a great find, and the sweet, tender little pillows dressed in the Beurre Blanc were heavenly. Plus I liked the visual effect of the translucent cooked chive buds, and it was enjoyable to twirl the chives up with the pasta around my fork to eat it. So after reading this, you either think my mind works in mysterious and wonderful ways when I daydream about food... or you think it might be a bit of a crazy place in there. Either way, I hope you can see that inspiration can come from anywhere, so you should always keep your eyes and your mind open to trying new things. You never know what you might come up with. This recipe can be a little complicated since you will make the components concurrently, but don't let that scare you because the result is definitely worth the effort. Plus, despite doing several things at once, the overall recipe doesn't take much time to put together - only about 20-30 minutes. With the right timing, this dish will come off without a hitch - and even if it doesn't, a good Beurre Blanc sauce will cover all manner of sins. To cook the pasta and chive buds, fill a large stockpot with water, and bring it to a rolling boil. Add the pasta and cook until al dente, according to package instructions. Once it is cooked, remove it from the water using tongs or a slotted spoon, and transfer to a colander to drain. Keep the water boiling, and add the prepared chive buds. Boil for about 7-10 minutes, or until the chives are tender and the buds look translucent. Transfer to a colander to drain. While your pasta and chive buds are boiling, make the beurre blanc sauce (following recipe below). Once it is finished, transfer it to a small bowl that you have pre-warmed briefly in the microwave (this will keep the sauce from thickening), cover it with plastic wrap, and set it aside. Quickly rinse and wipe down your sauce pan, then heat the olive oil over high heat. Add the garlic, saute for just a minute, then immediately add the scallops in one layer. (Do your best not to crowd them so they don't "steam.") Cook them for about 2 minutes on one side, then flip or move them to cook on the other side for about 1-2 additional minutes; scallops cook very quickly, and overcooking them can make them rubbery. 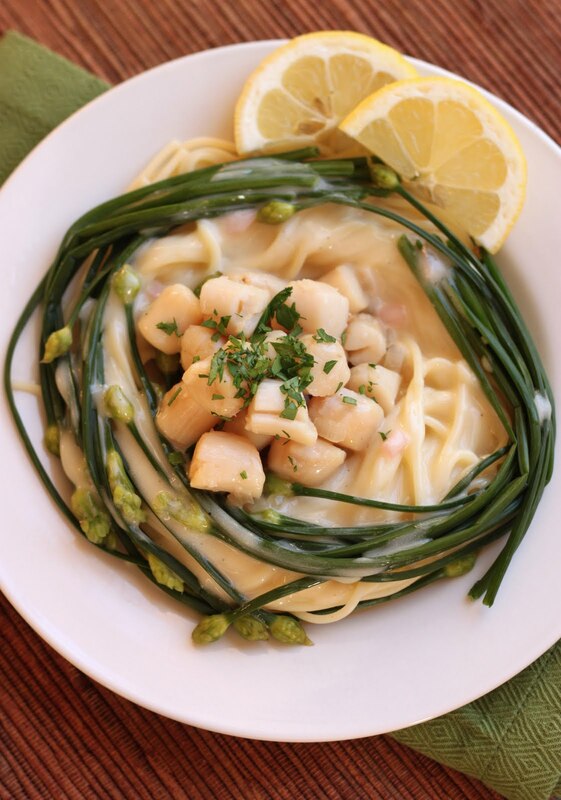 To serve, place a nest of pasta and chive buds on a plate, top with 1/4 of the cooked scallops, then drizzle the beurre blanc sauce over the top. If you like, garnish with chopped parsley, and serve immediately. In a saucepan, bring wine and vinegar to a boil. Add the shallots, salt and pepper, and then reduce the heat to bring the mixture to a simmer. Continue to cook for a few minutes until the liquid is reduced and there is only about 1 tbsp left in the pan. Your creation (because, hey, that's what it should be called) looks heavenly delicious. Love the use of the buds in this! What a refined tasting and beautiful dish! What beautiful chives!!! Your photos are incredible...I just want to dive into this dish. You got me at Beurre Blanc... how delish! Oh my heavens. This is perfection. I just recently planted some garlic chives in my garden. I will definitely remember your recipe when they bloom. I had to make beurre blanc everyday for 2 weeks at the restaurant I used to work, until I got transfered to the pastry station. It's so good with seafood :) I love how this dish came together, I get garlic chives every Sunday at the Chinese farmer's market. 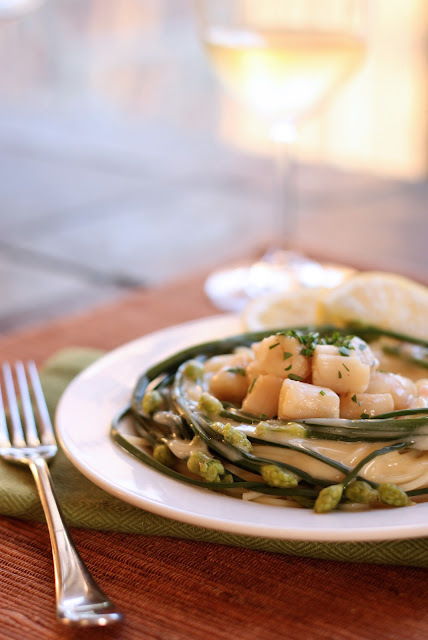 Mmm butter, chives and scallops = deeee-lish! Awesome pictures too! 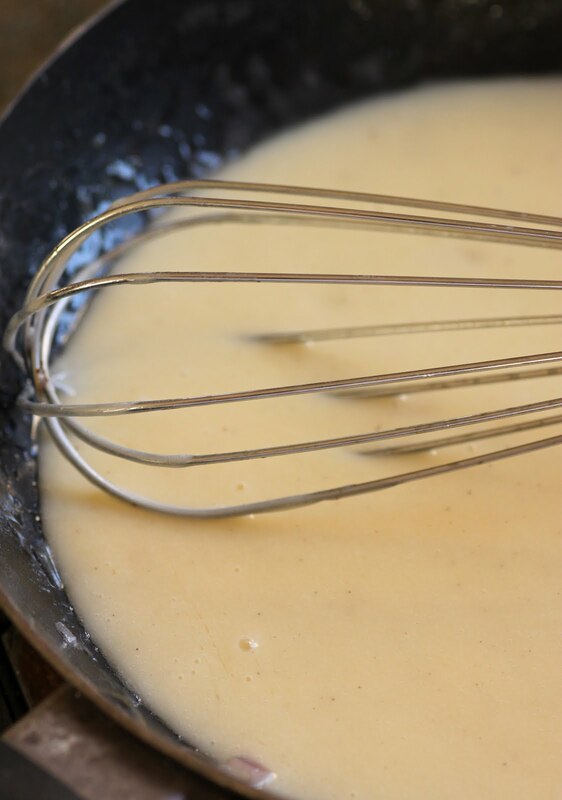 beurre blanc, the magic elixir! i love it as well. your photography is absolutely brilliant. What gorgeous shots! I've never seen chives like that. Beautiful. And I bet it was tasty. This recipe looks incredible. I love scallops and are always looking for a new recipe in which to try them. I will have to give this a try. Hopefully blogger won't crash this time! Butter, scallops, garlicky chives? I think I am in love! This looks so good! 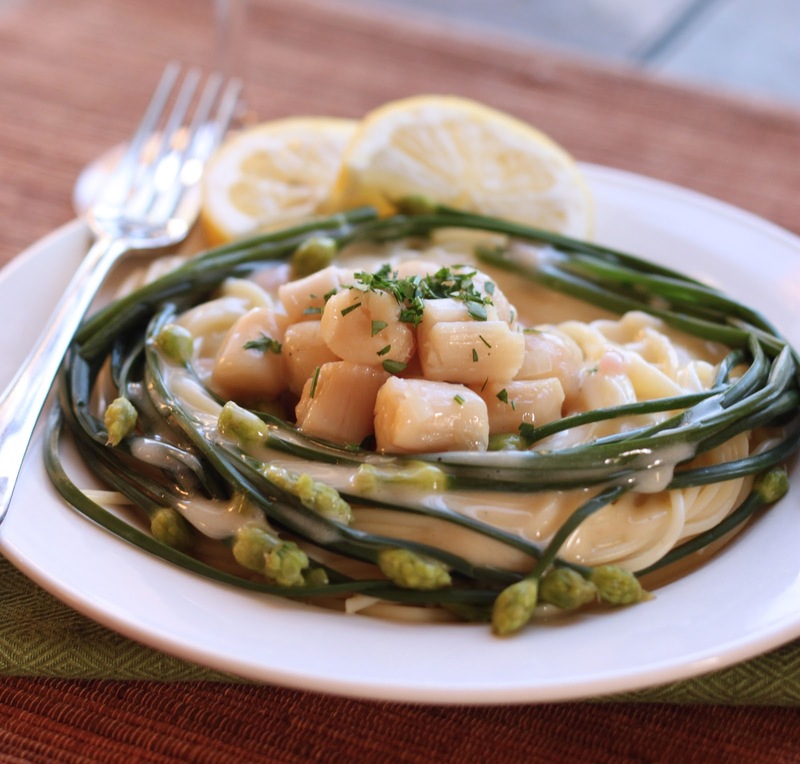 I adore scallops and it's so pretty the way you arranged the chives. Oh, and Garlic Chives- love em. They are so darn savoury my mouth is watering just thinking about them! The good soup: honestly I have never had it separate on me so the only tip I can offer is just to keep whisking and definitely add the butter cubes one at a time. Like I said, never separated for me, but others have mentioned trying to incorporate butter too quickly can lead to separation. Hope that helps! I've never seen the white chives, they're beautiful! Lovely buerre blanc dish.